Take advantage of the ultra compactness and speed/performance of Neousys’ new POC-200 fanless embedded controller! Can be applied to a wide range of applications requiring an embedded controller, such as PoE Camera, Industrial Automation, Digital Signage etc. The POC-200 is a fanless controller, ultra compact 146 x 102 x 58mm (W x H x D)—almost as to the same size as a 3.5 inch HDD, and can be easily built into existing systems in the production line, or used for customize systems. Powered by the new Intel® Bay Trail Quad Core CPU, 1.91Ghz E3845, the POC-200 is capable of upgrading to a maximum of 8 GB memory; feature isolated I/O provide users with the digital devices connection, the slick interior design minimizes compatibility and cabling issues. 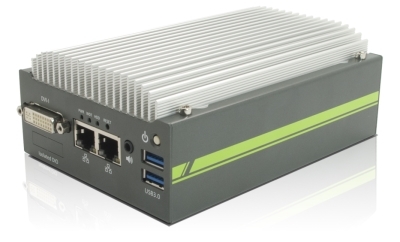 The POC-200 supports rich I/O interfaces, including 4x COM ports, 4x USB ports (3x USB 3.0, 1x USB 2.0) USB 3.0 ports enable fast data computation and acquisition, 4x isolated digital I/Os and 2x PoE GigE ports. The POC-200 also provides with one Mini-PCIe slot with one USIM socket for wireless requirements.